Micro-vibration stimulates crow's feet and eyelid laxity which can achieve a firming effect. Heated treatment stimulates skin cells through massage, locks in moisture, improves blood circulation and revives eyes fatigue. Relieves dark circles and puffiness, removes eye bags and reduces wrinkles around eyes. Negative ion makes skin care product maximize absorption. Please insert AAA battery in the correct polarity before use. Clean the eye area and gently apply a thin layer of eye care essence on the eye area. circularly over eye area where eye care essence has been applied. Massage the area for 8-10 minutes. Use it in the morning and evening. To prevent short circuit, please wipe the whole massager with a towel or tissue after use. Package does not include batteries. 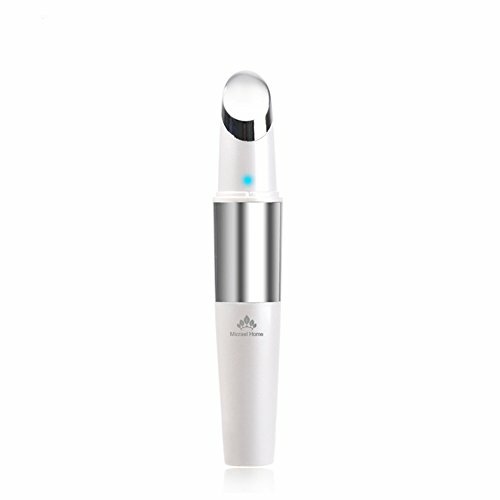 Micro vibration + micro current improve the skin around eyes, making eye skin glossy, removing facial rough skin, fading fine lines and crow's feet. Intelligent control, caring eye skin. Ion import, convenient for essence into deep skin. Preventing and removing eye wrinkles, eye bags, black rims of eyes, puffiness after staying up, etc. If you have any questions about this product by Micrael Home, contact us by completing and submitting the form below. If you are looking for a specif part number, please include it with your message.